To get started with your own fish, you must get the top-rated fish aquarium kits that have all you need. The fish tank should not be extremely big or tricky in setting up. It must be perfect to start out with fish. You can purchase extra decorations with the aquarium kits but they all include standard supplies which you require for your initial set up. The serene beauty of an aquarium creates a soothing ambiance to any place you put it in. Here, we will review top 21 aquarium kits discussing their features to help you choose the right one. A fish tank is easy to maintain and set up. It ispretty enough and a lively home décor product. You can select a big one if you have large space in your house. Simply adjust the aquarium to fit every condition and need you have for your house. • It reduces one’s stress level. • With its calming effects, it significantly decreases your anxiety level. • It can reduce your blood pressure. • It enhances Alzheimer patients’ conditions. • It makes you more creative and productive. Where to Put an Aquarium? Simply put it in your house for making it look stunningly aquatic. Place it in the living room, into the wall, under the staircase, in the bedroom, on a side table, or in the corner of a room. These places will help you make an innovative use of an aquarium. • Examine and monitor water parameter. • Cycle the tank prior to adding fish. • Perform water changes regularly. • Research fish before buying. • Abstain from overfeeding the fish. • Handle light in and around the aquarium. • Perform aquarium filtration on time. Although these instructions seem very difficult, if you follow the aforementioned tips, you will end up with a good fish tank full of healthy fish. If you are seeking a colorful zest to the ambiance, the GloFish Fish Tank Kit is the best option. This clear curved aquarium incorporates a microfilter and filtration system which utilizes a medium bio-bag. 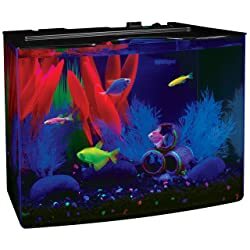 There are some LED lights equipped in this acrylic made tank which highlights the exceptional color of the fish, brightening your interior décor. 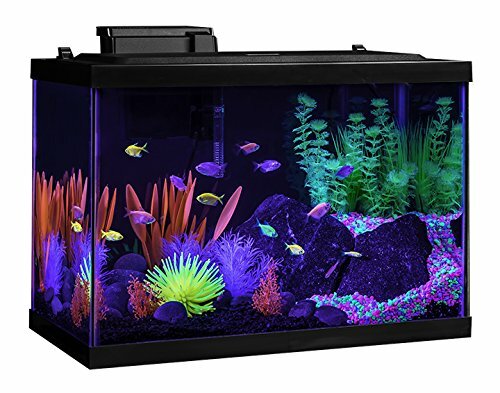 The Tetra GloFish Kit incorporates a Tetra Mini UL Heater, a 20-gallon glass aquarium, a Tetra Whisper 20 Filter, an LED hood, 3 GloFish Plants, a GloFish 13-inch LED Light Stick, and a GloFish Yellow Anemone. Its fluorescent décor makes a neon, colorful display. 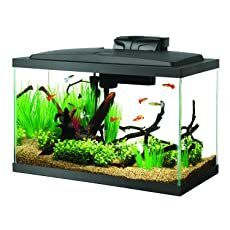 If you are an aquarist and seeking a conventional look in your aquarium which creates a relaxing and peaceful ambiance and has all the natural scenery but keeping your fish extremely different, you must opt for the Tetra 20-gallon Complete Aquarium Kit. The Tetra aquarium is loaded with an LED hood which offers a natural daytime effect. It also includes a Whisper Filter which whispers noiselessly while offering a reliable, strong water flow. 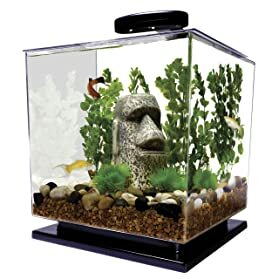 The Tetra aquariums are made with scratch resistant glass. 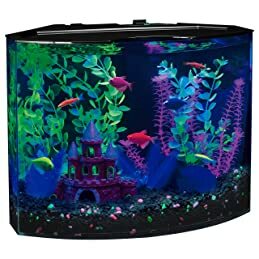 It is loaded with artificial plans which add a natural, unique ocean feel while helping your fish reduce stress. 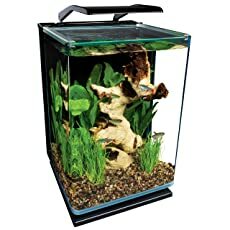 The Tetra Crescent Acrylic Aquarium Kit is ideal for a bedroom, kitchen, dorm room or living room. Its aquarium is perfect for keeping a goldfish or up to 3 community tropical fish. Do not forget to utilize a heater for the tropical fish. This aquarium kit includes a smooth, curved front fish tank, base frame, black cover, bright, energy-efficient LED lights for illumination. This kit utilizes ultra-activated carbon for high-end removal of discoloration and odors. From the tank, the water gets pulled by its mechanical filter and again pushed through the filter cartridge where the dual-sided, dense trap catches all wastes and dirt. To dive into starting a completely new tank, you must opt for the Tetra 20-gallon ColorFusion Aquarium Kit. This kit is ideal for any aquarist who seeks an exclusive aquarium with a vibrant display. It has a good size to contain multiple fish comfortably while not occupying much space in your house. This kit incorporates a UL heater, a 20-gallon glass aquarium, a ColorFusion Universal Color Changing LED, a Tetra Whisper 20 Filter, a blooming white anemone, and 2 Wonderland plant multipacks. The anemone sways with the filter current and provides the fish a place for hiding and relaxing. The MarineLand Portrait Glass LED Aquarium Kit contains a glass curved design fish tank. This aquarium kit incorporates a 3-stage hidden filtration which features an adjustable filter flow pump, a rite size cartridge Z, and a bio-foam. This aquarium’s filter caddy and pump are hidden in the rear compartment. This kit incorporates a sliding glass canopy and a hinged light for easy availability to the aquarium. Its blue LEDs generate a soothing moonlight glow whereas the white LEDs form a shimmering light in the water. The rear compartment amazingly hides all extra accessories from the viewing of the fish tank. 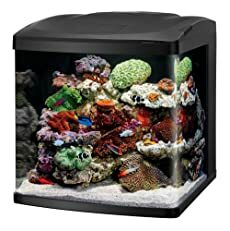 The Coralife LED BioCube Aquarium Kit is crafted with a clean-lined, sleek look and possesses different latest features which enable you to form an ambiance resembling a mini coral reef. This fish tank starter kit includes everything you need: filter pump, a light filter, LED lights and so forth. It features an integrated 24-hour timer with 3 independent channels: color improving LEDs, sparkling blue, and bright white. It boasts a customizable and compact inbuilt filtration since it is easy to install and maintain. 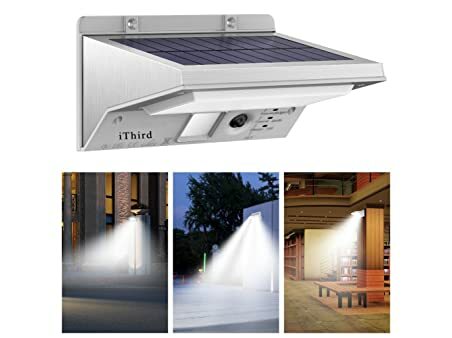 Other features include dual intakes, a noiseless submersible pump, vibrant LED lighting, and an adjustable return nozzle. If you can afford a slightly expensive aquarium kit according to your requirements, the Aqueon Aquarium Fish Tank Starter Kit is exactly what you need for installation. Furthermore, this kit comes with LED lighting which helps you know when you should replace the cartridge which is also contained by it. Its preset heater keeps the tank temperature at a continuous 78 degree, perfect for maximum tropical fish. It is loaded with a low profile LED full hood, a 10-gallon glass aquarium, premium fish food, a 50W preset heater, noiseless flow LED Pro Power Filter with the medium cartridge, fishnet, and thermometer. People who want to try a small aquarium starter kit, the Aqueon LED MiniBow kit is just perfect for them. LED lighting is offered by this kit inside a betta habitat which is stylish, appealing and will get an expert aquarist started off on the right way. Its compact design makes it amazing for use in smaller spaces. This kit is easy to install and maintain and looks amazing in any space in your house. It features low-profile, sleek LED energy-efficient light hood with feeding hole.This aquarium kit incorporates Aqueon Quiet Flow Filtration as well as water and food care samples. GloFish® adds an amazing color to any space of your house. These fun fish have an unmatched capacity to absorb light and re-emit it.The GloFish 3-Gallon Aquarium Kit offers all you require for encountering the Glo. It needs easy maintenance and installation process, making this aquarium idea for newbies as well as aquarists. It’s a colorful addition to any dorm, house, bedroom, or living room. 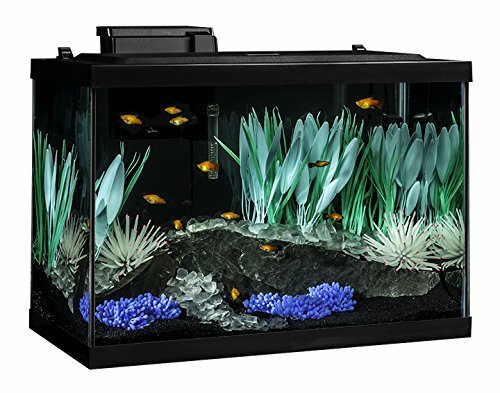 This exceptional fish tank kit comes with a 3-gallon GloFish aquarium, aquarium light with blue LEDs, Tetra® internal filter, Tetra® Care registration, low voltage power adapter, Tetra® medium filter cartridge, and an aquarium installation guide. Want to add a colorful zest to your surroundings? Then you must bring home the GloFish 5-Gallon Crescent Aquarium Kit. This 5-galloncrescent-shaped fish tank is made of a great quality plastic and can certainly brighten any space of your house. 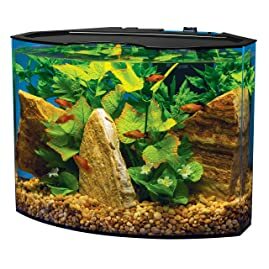 If you are an aquarist, this tank is perfect for you. Its LED lights highlight the exclusive color of the fish and illuminate both your interior décor and the fish tank. Its high-quality filtration system utilizes medium bio-bag filter. This kit incorporates whisper® internal filtration, small size filter cartridge, a crescent-shaped smooth plastic aquarium, and clear plastic canopy. The EcoQubeC Aquarium is the lowest maintenance desktop aquarium on the market. 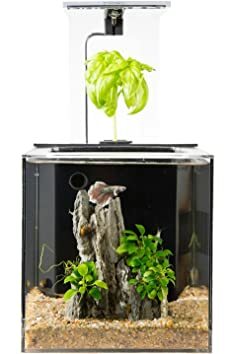 This tiny aquarium utilizes a Basil plant as a part of the aquaponics filter for filtering the tank’s water. This is why you won’t have to change the aquarium water or filter. It’s a flame polished, handmade, small fish tank kit which doesn’t incorporate aquarium décor accessories. This kit includes plant medium, remote for LED lights, and integrated aquaponics filter. It comes with a 1-year warranty coverage. This aquarium kit adds water and green onion or seed and after plugging it in, you can watch your aquarium’s liveliness. Being a green pet owner can be really exciting as well as daunting. 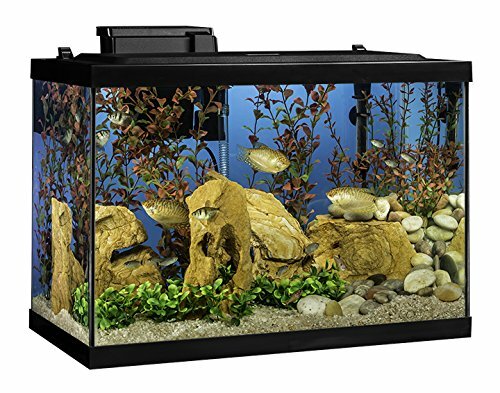 If you want to start your aquatic habitat, the Tetra Deluxe 20-gallon Aquatic Turtle Kit has everything you need. 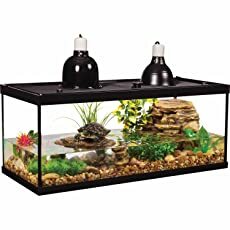 This 20-gallon environment which is amazing for newts and frogs as well includes a basking platform and a waterfall filter for your pet’s comfort. This big aquarium can be a showpiece in your house. This fish tank kit incorporates cartridges, a decorative filter, a boxwood plant mat, heating lamps, and screen top. Above the tank, 2 dome lamps are placed in the screen for prime basking and warmth. The Tetra LED Cube Shaped 3-Gallon Aquarium utilizes smooth styrene plastic rather than glass. It measures 10 inches on the side but it comes with a pedestal base for raising it off the table. It can hold up to 3 gallons of water. This tank is equipped with a Tetra 3i filter for keeping the aquarium clean and offers an ideal ambiance for the small tropical fish. 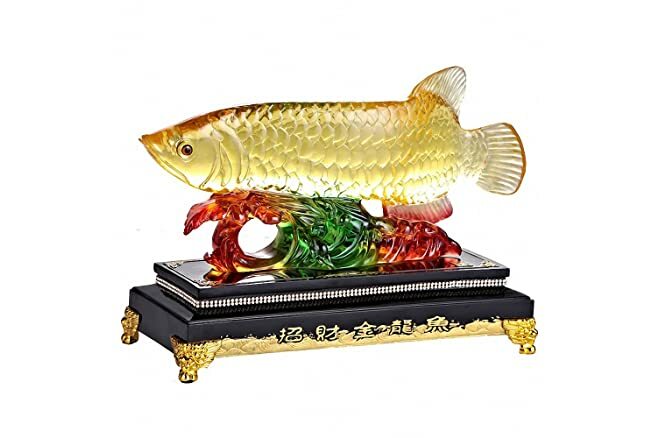 It is loaded with an LED light for displaying your fish. It’s appropriate for a betta, goldfish, and small tropical fish. The filter is driven by an air pump. It boasts a clear canopy also. The visually dynamic Aqueon NeoGlow LED Fish Aquarium Starter Kits can easily add fun color to any space of your house. These kits create awesome accents for bedrooms or even the kitchen counter. They boast a glass aquarium with fluorescent silicone which comes to life under the blue LED lights. The vibrant colored plants and the black gravel with fluorescent colored highlights are also incorporated for your interior decoration. 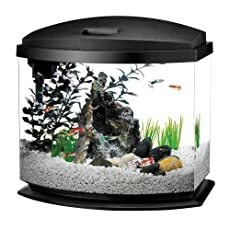 These fish tank kits incorporate multi-colored gravel, a black background, fish food, 3 plants, and water conditioner. It is equipped with medium cartridges and an Aqueon Quiet Flow LED Pro Filter. With all the sizes, styles, and shapes of aquariums available in the market, it’s quite tough to choose the best one. Purchasing a fish aquarium kit is an investment about money and time; hence, you should end up getting the right one. This review guide will help you choose the right aquarium kit from the different options offered and it will be your choice to measure whether the kit is perfect for you or not. You should get the right product to avoid all regrets in the future. We recommend you to remember all the duties related to a tank. How to make your bedroom Soundproof? How to save money & buy a new house for young couple?